Sizes are 110mm diameter, 250mm, 350mm, and 450mm. Choose from many stitches and colours. 200mm diameter seed bowl Feather, pictured in Pink, and Lumo Yellow. 250mm diameter bowls in Urchin stitch in Orange, and Bodhi stitch in Grey. 250mm diameter seed bowls in Champagne, and Nutmeg. 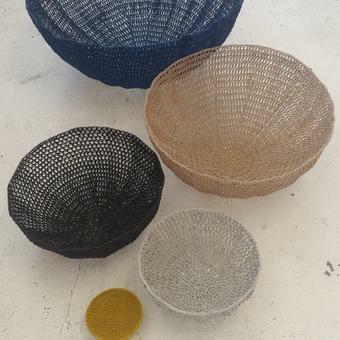 110mm diameter seed bowls in Champagne, Nutmeg, Black, and Gold. 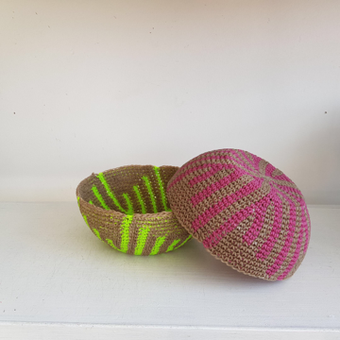 110mm diameter seed Bowls Stripe, picture in Lumo Yellow, Pink, and Black. 200mm diameter seed bowl Stripes, pictured in Pink, and Lumo Yellow. 250mm diameter seed bowl Feather, pictured in Pink.